The resort is conveniently located within mere walking distance from the Whaleshark Interaction Center: your launch pad to experience snorkeling with what the locals refer to as the 'Butanding.' We pride ourselves in spoiling our backpackers and other budget travelers with more amenities than any other homestays or hostels in the area. Apart from its close proximity from the Center, our guests can enjoy being by the beach, enjoying the use of our infinity pool, have fun drinking during happy hours at our well stocked bar, and dining at our restaurant that serves local and seafood cuisine at budget prices. Our backpacker rooms are spacious, limited to 3 guests each room, and comes with its own bathroom (hot shower included) and individual cabinets to secure your belongings. Most beautiful hostel. 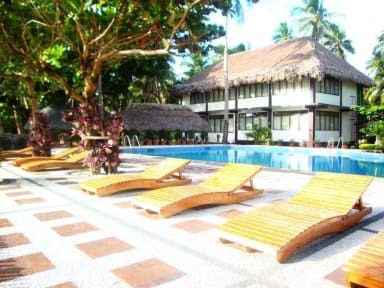 With a pool right on the water you can’t book a place in donsol with better value. It’s not a super social hostel, but I think that’s the vibe generally in this beautiful town. Location is also perfect as it’s right next to the whale shark centre and Baracuda (best food in town). A backpackers treat!! Dorm rooms consist of three double beds and an en-suite - and all the facilities of a hotel resort, beautiful grounds, pool and views of the ocean. Walking distance to whale shark tourist centre. Wish I could have stayed longer. Probably not super sociable but a great place to chill and relax. Amazing staff too! 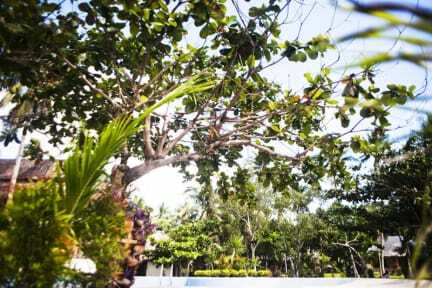 Strategically located within a few hundred steps to the Whaleshark Interac9tiin Tourism Office'l, the property offers comfortable lodging with good food and friendly staff. Great value for money. Next to the Whaleshark interaction Center. The Atmosphere is more like a hotel instead of a hostel. Great pool, bar, spa, restaurant right on beach, however, room was infested with ants and spiders everywhere! Cold showers only, very far out of town so limited eating options and staff misinformed me on van transfers which resulted in me missing a flight. I'd still reccommend staying here but be aware of bugs and of location. The location is very good and great food at the restaurant. The WiFi sucked and we had the most dirty room in all our travels in the Philippines.